This area is dedicated to giving you information you need to make a head and face for your own robotic monster. The head can be an important area as it can allow our monster to not only hold sensors like a cameras, sonar range finders and the like but also allows the robot to express its self. Such as giving the robot an LED readout for a mouth or servo controlled eyebrows to perhaps indicate the robot is in a sleep mode. This page will also include info for making a brain via software and other things that might go in the head of our monster like vision, hearing, voice and so forth. One idea for a head is to use something so that the robot can wear a mask. In fact one idea I tried on my monster was to use a plasma globe as a head. Over this I put an all black (yet see through) grim reaper mask. And over that I attached a silver Jason mask, like the ones you find at Halloween time. The effect was very scary. The plasma globe glowed dimly through the mask, out the eyes and mouth, which gave quite an intimidating presence. It looked as if neurons were firing in some sort of brain. I later decided I wanted to use a camera in the head of my monster so the globe went and the mask was used at Halloween. This mask even scarred my dog! This is a picture of how you can use a Halloween mask and hardware to make an articulated face. This diagram is from the Yoda Project website, and by clicking on the picture you can go to the website for more in-depth details on how to make a Yoda head. From the picture you can see the main parts are a Styrofoam dummy head, servo, speaker and some wood. Big thanks go to the great people from the Yoda Project !! 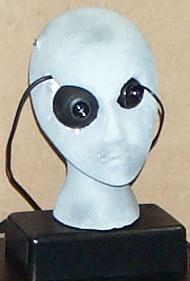 A take off of the above head is to turn a cheap Styrofoam head into a Borg head. Some of you might recall the Borg characters on Star Trek The Next Generation. Below are pictures which so my design progression. 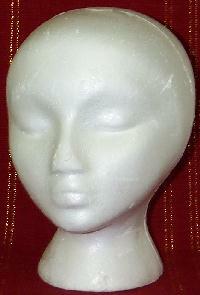 The first head shows a plan and cheap foam head. You can pick up heads like this at Halloween stores, from beauty shops or online for $1.69 from this place. Now you'll have to use your imagination at this point to envision what a complete Borg head will look like made from a cheap foam head like this. Cutting the foam is very easy with a utility knife. As you can see I have added an eye ball sized and shaped camera to my Borg head. It's black and white and has a built in mic. Not bad for $50. My complete Borg head will be servo controlled to turn left and right. I would also like to add servos to tile the head up and down. The tape and so forth will be gone from the complete project. I also plan to paint the head a grayish green color to keep with the Borg look. You can not use normal paint on Styrofoam! You must use latex paint! In the first picture here you can see a microphone amplification sensor. It's one of those $7 super sonic hearing devices. The mic has a clip on it. The clip was placed into the head and is help in place with dry wall putty. I have used dry wall putty to full in holes and imperfections to the Styrofoam head. It takes a good couple of days to really dry, but it strengthens the head. So with the clip mounted I can now remove the mic when I would on the head. This last pictures so my B/W camera which will transmite video to a monitoring station and the new larger eye is a Color Quick Cam, parallel port version. It was on sale a while back from ComputerGeeks for $13. This will be wired to an onboard PC for experiments in computer vision. The head is now mounted on a plastic project box and rotates via a standard R/C servo. The head has been painted in mixture of black and white latex paint to make gray. Over that I sprayed normal black and green spray paint to produce Borg like skin coloration. Once a coat of latex paint is on Styrofoam you are free to paint it with any sort of paint you want because you will no longer destroy the foam. Another great head project on the net is the $600 Maxamilian android head from HowToAndriod.com It's "A website dedicated to showing others how to build their own Android robots." It gives you all the info you could need on how to make a $600 android head with two cameras and Java programming. Yet another option for an interactive head would be to take a product like the Talking Boris head which you can find around Halloween time in the US and hack it for your monster robot. The cost of this head was around $10 at an after Halloween sale! 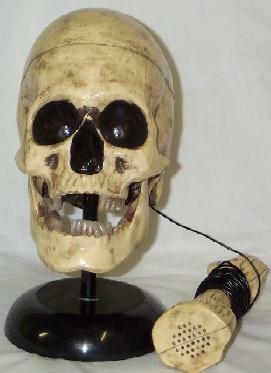 The head is a skull of course, with red LED's which light up in the eye sockets. The mouth moves up and down to simulate speak. There is also a speak located under the head. This Boris has a wired microphone which you can talk into to make Boris talk. You can also change how your voice sounds by switches located on the back of the head. You can have a high pitched voice, low pitch, robot voice or normal pitch. Most department stores would carry such items as this in the US around Halloween time. They also make a wireless Talking Boris head. With new products coming out every year who know what you might find to hack for your monster robot. Wally (my monster) did have a really neat head that was covered in smooth aluminum sheet metal and a hole for a camera lenses in the middle. This made Wally look like a Cyclops droid. The head also rotated via a servo and had really neat antennas coming out of the top of the head for transmission of video data to a monitor. However, this head has since been removed and Wally is on hold for a different sort of monster robot platform I am working on which will use the Borg head as mentioned earlier. 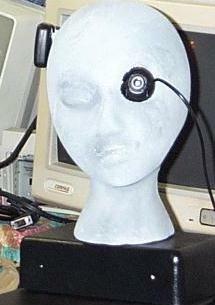 This is and animatronic head which is on my robot named Ity Bity. It's a kit I bought from the robotstore.com. Cost was about $198. It includes everything you need to build this servo controlled head. It also comes with a animation controller card which allows you to record movements of the head as well as up to 16 seconds of digital sound. 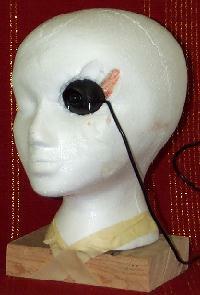 The controller will run from a 12 volt battery and has a port for interfacing to a motion sensor or other controls for activation of the pre-recorded movements of the head. The board is controlled by an included Basic Stamp II. The head is really awesome to play around with and it's a great way to give your robot a way to communicate or interact with other people. For more advanced controls you'd have to create your own programs with the Basic Stamp II or use a micro with more memory storage space. This kit comes with four servos which control the eyes moving from left to right. The mouth opening and closing. 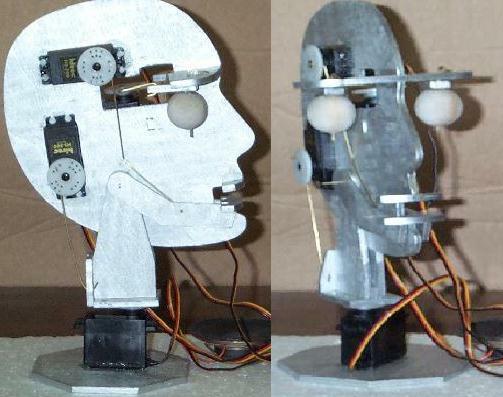 The head tilting up and down to make a nodding motion and a rotation servo for the neck to turn the head left and right. 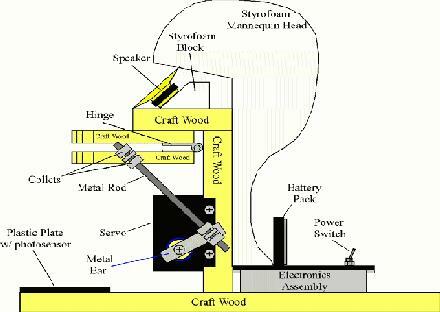 The hardware of the head would be VERY simple to make on your own, if you have good wood working and mechanical skills, which I did not at the time. I'm very happy with the purchase of the kit, if you were to buy all the parts to build this head yourself you'd only end up saving about $50 and you'd not have the software which comes with the controller board making it SO easy to create complex animation movements of the face that are actually in sync with the voice. If you are going to use a laptop or another type of PC you might be just as well off to use software in the computer for voice synthesizer and recognition. However, if you are going to use embedded controllers or a PC set up that does not allow for all the extras then for voice synth I would recommend the V8600, it runs about $150 and they say it can work with almost any microprocessor bus, serial, or printer port! Of course hacking a toy with one of those new digital voice recorder chips might work just as well if your robot is only going to say one or two things. Pre-recording a message on a cassette would work too if you want to hack your walkman. If you want do experiment with voice recognition and are a good programmer used to working with VC++, VB++ or VJ++ then you might want to download Microsoft's Speech Application Programming Interface (SAPI). For voice recognition you could buy a kit from the Image Company that sells for $140 assembled. It can handle 40 user programmed words and comes complete with a keypad. Or you could by the popular Voice Direct speech rocgnition kit. This unit can work stand along while handeling about 8 voice commands or you can interface it to a computer or micro controller to recognize about 60 spoken commands! This unit is very small and only costs $60 from The Robot Store. Many roboteers out there are currently experimenting with these units and expanded the knowledge base about them. I have two of these units myself. They are easy to set up and do a great job of recognizing work, however they do not have a good hearing range. So far they seem to work best with some sort of walkie talkie type transmitter for voice commands. Well you can making a brain with an electronics neural net....BLAH BLAH BLAH...Artificial Intelligence....BLAH BLAH BLAH....when computers are able to processes more information than all the humans in the world will...BLAH BLAH BLAH.....android design is becoming more affordable...BLAH BLAH BLAH. Ever been to a website or read information in a book on robotic brains or Artificial Intelligence that sounded like that? Well it sounds that way to someone not in the loop of scholarly endeavors. If you read enough of these books and throw yourself into research you can understand just as much or more on the subject than professors at MIT. I don't want the Frank N. Stein site to go over board with heady stuff. We are going to try to show you how to use simple tricks to make your robot smart. When it comes to brains I refer the movie Frankenstein as I ghoulishly search the internet at night looking for an ABY NORMAL brain that I can steal. That's not exactly true, for my monster I am mixing some ideas from here there and yonder. I am mostly sticking to Kevin's AI theory. You might find your monster's mind in a mix with other works and ideas or other people's code. My advice is to borrow and use free code as examples, take parts you like and think are cool and create the rest...then make a website and tell everyone about it...that way the cycle of robot life continues. For myself I have a funny idea I have been refining for a while now. I call it "Back Pack Intelligence". The idea here is to get my monster to look smart with it's network of smaller processors, like Basic Stamp II's. These processors will handle individual problems of control. There will be a processor for the main drive, one for the arms, one for the head and so forth. Each almost making a unique robot in themselves. The idea is for the network to take care of straight forward control, i.e. I tell the robot to go to the kitchen and maybe the processor for hearing the head will tell the processor for the drive to move to the kitchen. The backpack comes in with the addition of a laptop PC. The PC would control things like voice recognition and camera vision or what ever is really to much for a embedded processor like a Stamp to handle. It will also be linked to the network of micros so it can send and receive info from each. It will be a backpack brain to the network. It will have a program to store actions and information from the network. It will ask it's self why it was sent to the kitchen? should I go to the kitchen on my own, what did I do in the kitchen? and from that the program will look for pattern in data. It will then issue commands to the network as it learns more. The advantage I see from this backpack is it allows you to get your robot up and running with the embedded processors and allows you to create systems one at a time. After all you are learning at the same time, so why make things hard on yourself. This method is somewhat advanced, networking things is no easy task. My backpacking will allow me to have straight forward control, while playing around with AI that does not have to work at first, and so does not affect the monster functions very much. This is not really a new idea. Using co-processor with a PC is very common in advanced homebrew creations. It's just that no one else is doing it this way. So my monster brain will be one of a kind. I think backpacking would be a very good idea for anyone who has worked with Stamps or other smaller processor on robots and is looking to make something bigger.